Lehigh Valley (44-32) Beat Durham, 7-1. Anthony Vasquez (1-0, 4.32) scattered 7 hits and struck out 7 while allowing one run in 6.1 innings. Andrew Knapp had 3 hits, J.P. Crawford had two. Carlos Alonso had 2 RBI. Brock Stassi (.265) drew 4 of the IronPigs’ 11 walks. The Bulls struck out 15 IronPigs’ batters. Taylor Featherston (.267) led the way with 4 K. Darin Ruf (.291) followed with three. #1 Crawford (.231) went 2-4 with a double, BB, and RBI (10). #2 Thompson (6-5, 3.09) – DNP. #3 Williams (.288) went 1-5 with a double and RBI (35). #4 Appel – DL, shoulder strain. #9 Knapp (.266) went 3-3 with with 2 BB. #13 Eflin (5-2, 2.90) – promoted to Philadelphia. #23 Sweeney (.231) went 0-5 with an RBI (20) and SB (8). #26 Asher – Restricted List. #28 Ramos (0.38) – DNP. #30 Lively (3-0, 2.09) – DNP. Reading (53-22) Beat Portland, 8-4. Ricardo Pinto (3-3, 4.32) pitched into the seventh inning giving up 4 runs on 9 hits. He threw 102 pitches/65 strikes. Alexis Rivero (2.70) notched his first save with 2.1 innings of 1-hit relief. Jorge Alfaro and Jake Fox (.264) had 2 hits apiece. Andrew Pullin extended his hitting streak to 19 games with a first inning, 2-run home run. Fox also had 2 RBI (40). Pullin got an outfield assist when he threw out a batter trying to stretch a single into a double. Jesse Valentin is hitting .281, Angelo Mora .268 so far this season. #6 Alfaro (.301) went 2-5 with a double and RBI (39). #7 Quinn (.288) DL, oblique. #10 Pinto – (3-3, 4.32) – 6.2 IP, 9 H, 4 R, 4 ER, 2 BB, 4 K, HR. #15 Eshelman (0-0, 1.80) – DNP. #18 Pivetta – (7-4, 3.43) – 4.0 IP, 10 H, 3 R, 3 ER, 0 BB, 4 K, 1 HR. #19 Hoskins (.278) went 1-3 with a BB and RBI (60). #22 Cozens (.273) went 1-5. #27 Brown (.234) went 1-4 with 2 RBI (20). Clearwater (42-29) Beat Brevard County 5-4. Luke Leftwich made his first Clearwater start and got the win. He went 5.1 innings and was lifted after throwing 88 pitches/60 strikes, and allowing a single and hit batter. He allowed 2 runs on 6 hits, struck out five, and walked NONE. Matt Hockenberry (1.65) tossed no-hit ball for 1.2 innings, setting up Ulises Joaquin (2.08) who earned his 6th save while giving up 2 runs on 4 hits over the last 2.0 innings. The Threshers had double-digit hits again. Carlos Tocci, Scott Kingery, Cord Sandberg (.241), Austin Bossart, and Herlis Rodriguez (.233) had 2 hits each. Sandberg hit his third home run of the season. Zach Green collected his 46th RBI. The Manatees stole 2 bases off Bossart. #11 Kingery (.274) went 2-5 with an RBI (21) and 2 SB (19). #12 Canelo (.243) went 0-4. #14 Tocci (.275) went 2-5 with an RBI (25). #15 Eshelman (4-2, 3.54) was promoted to Reading. #20 Tirado – assigned to Lakewood. #21 Garcia (6-2, 1.97) – DNP. Lakewood (31-41) Beat Greenville, 5-3. Jose Taveras (3-6, 4.12) tossed a strong 8.0 innings (game score 96). He struck out 15 batters, allowed a single run on two hits and walked NONE. He threw 106 pitches and 72 strikes. Alberto Tiradi relieved with a 5-1 lead and only went 0.2 inings. He gave up 2 runs on 1 hits and 2 BB while striking out two. Zach Morris (3.03) got his second save by striking out the final batter. Grenny Cumana (.288) had 3 hits. Zach Coppola (.372) and Josh Tobias (.291) had 2 hits each. Tobias had 3 RBI (44) and Cumana two (14). #5 Randolph – DL, shoulder. #8 Kilome (1-6, 5.12) – DNP. #20 Tirado – 0.2 IP, 1 H, 2 R, 2 ER, 2 BB, 2 K.
#24 Pujols (.237) went 0-3 with a BB and 2 K.
Williamsport (4-5) Lost to Auburn, 5-4. Felix Paulino (0-1, 3.60) gave up 10 hits in 4.0 innings. He allowed 5 runs (4 ER). Scott Harris, Kenny Koplove, and Tyler Hallead held the Doubledays to one hit over the final 4.0 innings. Luis Encarnacion had 2 hits. Juan Luis had 2 RBI. #16 Medina (1-0, 0.00) – DNP. GCL Phillies (1-0) Suspended v. the GCL Yankees West, 3-2 after 6 innings, although six innings is enough for a game. I had the score 3-3 when it was suspended. Nick Fanti had a nice line – 3.2 IP, 2 H, 1 R, 0 ER, 1 BB, 8 K. I believe he was lifted because of his pitch count. In the fourth, he went backward K, line drive single to right (the only hard hit fair ball he allowed), error on a FC at second that might have been a DP, and another backward K. His unearned run scored after he left when reliever Luis Gonzales made an errant and ill-advised throw to third when the runner on second broke early on a steal attempt. Fanti was leaving his off speed pitches up early. The Yankees pulled three foul balls deep to left. One had HR distance. As he gained control of his pitches, the strike outs mounted. Half were on called third strikes. Three of those four were on his off speed pitch. Jhon Nunez relieved Gonzalez with one out and the bases loaded and escaped the mess with a K and a fly ball to center. Austin Davis was set to come in when the game was suspended. Jhailyn Ortiz was called out on strikes on a questionable call. He was HBP his first AB, and walked in his second. #25 Jhailyn Ortiz went 0-3 with an RBI and HBP. Here is a group of players, mostly pitchers watching the game from behind the plate on Ashburn Field. Usually, only pitchers hang behind the cage. But Moniak, Stobbe, and Stephen sat with this group. Moniak was sitting with a towel over his shoulders for a while. When he first sat down a group of autograph chasers surrounded him. He was sitting next to his friend Kevin Gowdy. This is a side shot of the group a little later. Gowdy is in the center, leaning forward blocking Moniak. Stobbe is wearing the dark sun glasses. In the background, center-left is Alec Asher in the red hoodie on the top row of the bleachers. The young man standing to the left of Asher with the towel around his neck is “C” Randolph. There were some interesting non-players in attendance. Chris “Stats” King (Perfect Game and 2080 Ball) was present as the official scorer. Philadelphia sportswriter, Paul Hagen was down getting a couple of stories. Joe Jordan was here. He’s very happy with the job Johnny Almarez and his staff did with this year’s draft. And Dickie Noles was behind the cage discussing the pitchers with a friend. He asked me if I was a scout. I told him I was just an eaves dropper. Saw Roman Quinn too. He says he feels good. But I’m reminded of how confident he sounded when he first arrived in Clearwater last year. However, I refuse to be pessimistic. And, finally, for the record, since I’ve seen at least three pronunciations in articles and Twitter. I asked Mickey how he pronounces his last name. It’s Moniak just like it’s spelled. Haha, seriously it’s Moe – nee – ack. That’s Moe like Moe, Larry, Cheese. Not a Jamacian “mon” or a “mun” like in Monday or money. So that’s that. DSL Phillies (6-13) Lost to the DSL Royals, 6-4. Daniel Romero had 3 hits, Dixon Gutierrez had two. Robert Paulino had 2 RBI. Dixon Gutierrez (.362) went 2-4 with a BB. Jonathan Guzman (.299) went 1-5. DSL Phillies2 (8-11) Beat the DSL Rays, 5-0. Luis Mendoza and Juan Avila had 2 hits apiece. Leonel Aponte (1-1, 0.87) – DNP. 6/25 – Lakewood BlueClaws sent LHP Austin Davis on a rehab assignment to GCL Phillies. 6/25 – Randy Alcantara assigned to GCL Phillies from Williamsport Crosscutters. 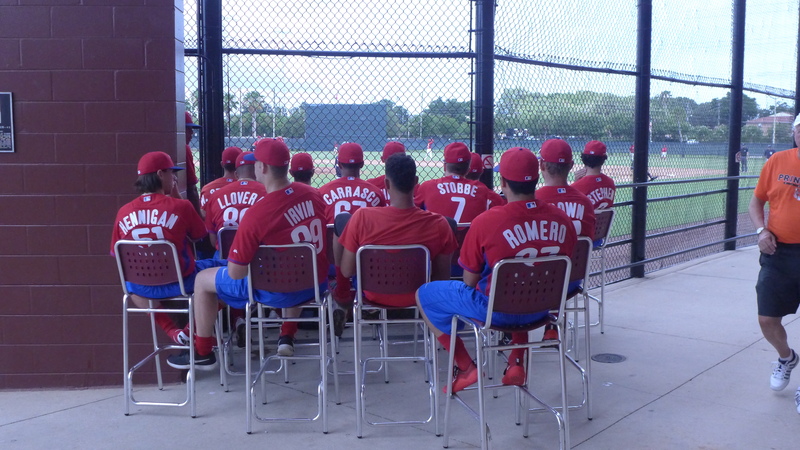 6/25 – Jose Nin assigned to GCL Phillies from Williamsport Crosscutters. 6/25 – Geury Ortiz assigned to GCL Phillies from Williamsport Crosscutters. Organization Rosters are up to date. Reported signing bonuses for Josh Stephen ($600K) and Justin Miller ($100K) have been added to the Tracker. That leaves $1,115,160 available for #5 Cole Irvin (slot $417,500) who has signed and other over slot signings. John Hennigan and Andrew Brown are in Clearwater. 2016 Draft Tracker is up to date. watched Taveras for the first time, he was impressive of course as at one point he struck out 4 of 5 batters and retired the first 13 batters he faced. Does he always work that fast though, the hitters kept asking for time to slow him down. The first pitch of the game though got crushed but went foul, it looked like it was a sure HR and I thought not a good way to start the game but the next pitch he got a ground out and went on a roll from there. Don’t know much about him but he seemed to be throwing a pretty good CB. Right now, with his 15Ks, 2Hs,0BBs,Taveras has the highest Game Score of any Phillies minor league pitcher this year…96. Pretty impressive. Taveras, wow. A game score approaching triple digits is truly impressive. And he was pretty efficient, too, needing 104 pitches (72 strikes) for 8 innings. Zero walks really helps in that regard. Nice. The DSL2 stats don’t correlate to the game. The hitting stats match the 5 – 0 win but the pitching stats show the Phils farm team winning 7 – 2. But Denny Martinez, who was the winning pitcher, shows he’s 0 – 2. Up in the line score section of the box it shows Martinez as 1 – 1. Not sure what to make of it but it’s sure messed up. Not sure what to do with Tirado. They’ve tried him at LKW. They’ve tried him in CLW. They sent him to XST. He’s young and has a tremendous power arm so they are trying everything they can think of to help him. I just hope he doesn’t kill somebody during the process. Does Kenny Koplove have an arm like Tirado? He had a miserable first part of the season in LKW. They dropped him to Wmsprt and I’m not seeing improvement. Unless he has a 100 MPH change up and a heater that hits 140, let’s move on. I hate to really get down on a guy and I’m sure he’s pressing right now because he knows with every outing, he’s that much closer to being released. Martinelli and Lartigue with their first professional hits. That’s got to feel good. The winning percentage at AAA, AA, and A+ is outstanding. Jim Irvin is reported at 800k! Wow, must have a great agent. There goes the bonus pool. Looking at the draft tracker they don’t have many players left to target. If the 800k number is correct, that give them around $400,000 to try to coax a remaining prospect or two but I expect they are about done. 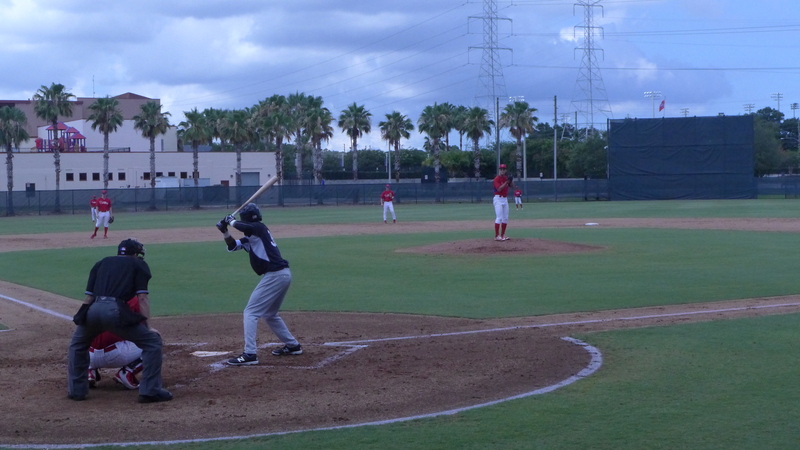 There is one lefty I would like to see them try to sign…the 6’10” fairly thin LHP Kyle Young at 22. He has the size that intrigues me and understand he does have decent velo high 80s/low 90s as a HSer, Committed to Hofstra, a local college for him since he is from up there, so the phillies may be able to offer him something to entice him to sign. Kyle Young is a lot of arms and legs but could have dream potential. Yea, I assume most if not all of the remaining HS players are guys they probably didn’t have a legit chance to sign. Teams always hope that one of those guys suddenly decides not to go to college..
Where did you read $800K??? That’s almost double the slot. However, that was the figure I was going to guess for him. Just a SWAG no valid reason for me to guess that amount. Part of the remaining pool+ may have been used to induce #13 HS Andrew Brown to sign. So, there may be even less available than we are aware. Never mind. Found in on MLB Trade Rumors. Thank you, Sam. I might be missing something because it’s a beautiful Sunday afternoon and I’m firing on one cylinder. But how can the $800k be right. That only leaves $315k for #11-40 picks over $100k. And supposedly Stephen already got $500k. The Phillies draft bonus pool is $13,405,200. They can go over that amount by 5% ($670,260) and only have to pay a 75% penalty on the overage. So in effect their bonus pool is $14,075,460 ($13,405,200 x 1.05). This includes any bonus over $100,000 that goes to any draft pick in rounds 11-40. So far the Phillies have spent $13,260,300 on draft picks 1-10, plus an extra $500,000 on Stephen (signing bonus of $600,000) in round 11. So their bonus spending is currently at $13,760,300. That leaves $315,160 remaining for any additional bonuses over $100,000 in rounds 12-40. So, short answer, Stephen is already factored into the $315k that remains. So these are the seven left who could reasonably expect more than a $100K offering to forego any college commitment or if JUCO(Davis Agle) go onto their last year at a 4-year school? – It’s possible that someone like RHP Trevor Betancourt (round 29) out of UCSB could want more than $100K (just speculating), though it would be a gamble for him. – I haven’t seen a signing bonus reported yet for round 13 pick Andrew Brown. Brown’s bonus would decrease the available pool if it’s over $100k. – Finally, round 30 pick Logan Davidson has indicated that he is sticking with his Clemson commitment (he might already be enrolled). Oh yeah…..Logan Davidson is suppose to be at Clemson this weekend if I recall he had said earlier in an interview. Another great day on the farm! This is fun! This sight has the best phillies minor league reporter. Not just the best blogger…the best reporter in any published medium. After a rough adjustment period, it looks like Crawford is settling in. Jinxed him, as Crawford proceeds to go 0 for 5. EDUBRAY!!! Wow that’s some moving stuff! Thanks Jim I really appreciate all of your efforts and talents. I am a daily reader and infrequent poster but the site is fantastic. I know there is general skepticism from some on the site as to what Tocci will amount to ultimately but he is having a pretty nice 20 year-old season at high A. Over the last 10 he has been dominant. I do understand the concerns from a strength perspective but I have always thought that getting stronger is the one guarantee you have with prospects. Reports have him as a strong defender, his approach at the plate seems good and he has always played at a level or two higher than his peers from an age perspective. I am hopeful the strength will come but I think he may be an underappreciated asset in the organization. Topley, you can post anytime you want. Your breakdown of Tocci is spot on. He’s young. He’s small boned. He looks like he’ll be a flyweight for many years to come. But they said that about Galvis. He started pulling trains around some outfield and built himself up plus a bout with performance enhancing drugs. He’ll never hit 20 HRs and neither will Tocci. But if Tocci can continue to make contact and get on base, he can play CF with the best of them. He’s hard to project but if he continues playing like he has been, everyone will have to take him seriously. Agree. Power will never be a big part of his game but he could still be a contributor. He started the year terribly and has been great lately; what he does the rest of the season could tell us a lot about him going forward. Looking at his season numbers as a whole, he’s improved from his CLW debut last year. He’s got much better K/BB numbers and has been much better stealing bases (though he still needs work there). By wRC+ he’s a league average hitter, and he’s still playing against mostly older players. Agree. Tocci is as graceful an outfielder as you’ll ever see. Glad to see an extra-base hit mixed in there. Love that Hennigan and A Brown were signed now there’s a Duke pitcher at 6 “10” and a pitcher form Stanford . Rhys Hoskins has really been on fire these last 14 months. Over his last 1064 PAs, including his Australian time this past winter, he has 45 HRs, 69 2Bs with over a .900 OPS. And it looks like he has even bulk muscled up a little more. Man, will Nola need a stint in the minors to get his head clear? He is a mess right now. He has no confidence. Phil Klein is looking good. The Phillies are ready hitting taking pitches and walking need the gloves to step up,The relievers too. Araujo to LHV, Morgan goes to the pen.